The army officer and the soldiers guarding Jesus saw this earthquake and everything that happened. 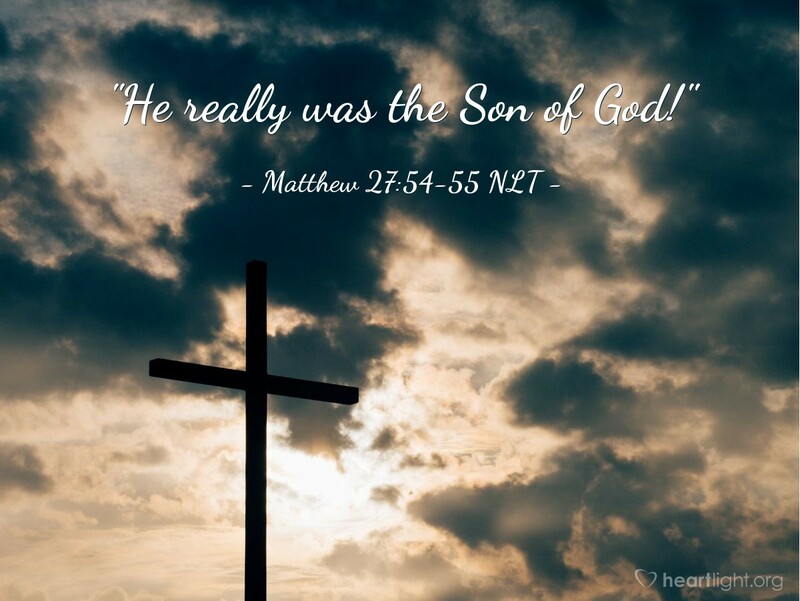 They were very afraid and said, "He really was the Son of God!" Many women were standing away from the cross, watching. These were the women that followed Jesus from Galilee to care for him. First, admire the faithfulness of the women who stood at Jesus' side while his male disciples forsook him and hid. Second, appreciate the soldiers at the cross who are struck by Jesus' demeanor and God's signs in the environment so that they confess him as Son of God. While much has been made about the fear, disillusionment, and unfaithfulness of Jesus' disciples, especially the 12 apostles, we don't seem to emphasize the profound faithfulness of women believers all the way through Jesus' trial, crucifixion, resurrection, ascension, and pouring out of the Spirit at Pentecost. While Luke emphasizes this point more than the other Gospels, it is important to notice how important a role the faithfulness of women have played throughout the history of the Jesus/Christian movement. They were faithful when others weren't. They supported his ministry financially. They were the first to the tomb. They were there in the upper room at Pentecost and were participants in the prayer meetings. They played a key role in the planting of the Church and providing the church places to meet. Let's give thanks for the faithfulness of Christian women! Even more incredibly, the soldiers who were grizzled veterans of crucifixion duty recognize in Jesus' death by crucifixion something very different from the others they had done. Jesus had promised that his crucifixion would be a time of glory. We recognize that glory as we place our ultimate trust in his work on the Cross to save us and cleanse our sins when we share with him in his death through baptism. But the glory of his Cross even had a more immediate effect. While the message of the Cross does seem a bit bizarre, even today, it is a great reminder of God's ability to take the worst of our world, absorb it, and bring us to a better place, a closer place, to him. Father, thank you for your faithful servants, the women of faith, who have meant so much to your people, and especially to me. I thank you for their time, effort, and prayers to teach and discipline me in your truth. I thank you for their courage to stand up for you when men have cowered in fear. I thank you for the ridicule many have faced with grace and dignity when their husbands or fathers did not believe. Thank you for faithful, godly women, several of whom I want to thank you specifically for now, as I pray in Jesus' name. Amen.